My good friend Nyk invited me to stay the weekend with him in Northern Virginia the same weekend that UDO and Raven were playing Jaxx Nightclub in Springfield. While I’m not the biggest Accept or Raven fan, I knew that we would be on the guestlist because at the time, Nyk was friends with John Gallagher of Raven. 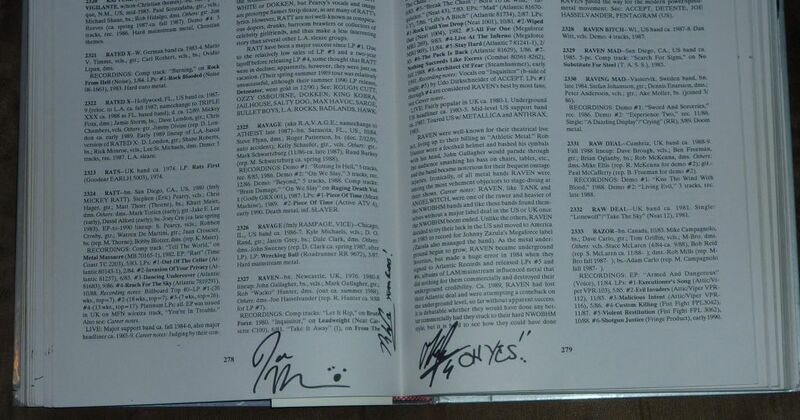 It would also be a good opportunity to get some more sigs in The Book. Raven’s drummer at the time was Hasselvander from Pentagram, a band that I am a HUGE fan of, so the chance to meet him is worth the trip in itself. And to be clear, I love Restless and Wild and Balls to the Wall but I’m not as familiar with their other albums. I owned Metal Heart and Russian Roulette at some point but I really don’t remember either one of them. And Raven? I’m not a fan…at all. There, I said it. Talented dudes, but not my thing. The day of the show we have dinner with the Gallagher brothers and they were super nice guys. If memory serves me well, dinner was at an Asian place. A few Raven fans spotted them and came over to say hello. Honestly, prior to that day I wouldn’t know those dudes if they were standing next to me. They take off for the show and we bum around for a bit then head there ourselves. We’re on the list and get to go in the “upper room” above the bar while one of the opening bands was on. Hasselvander was up there and let me tell you, he is one of the coolest dudes around. We talked about Pentagram quite a bit as he was still involved at the time and his connection with Blue Cheer and his new band, Hounds of Hasselvander. He was putting on some eyeliner and with it he can really pass for Ozzy. Fun dude. He signed the book as well the Gallagher brothers and I went back to put it in the car. It’s a bit of a pain to lug around all night. Right as Raven was going on, we were just standing a ways back from the front and I turn to go get a drink or something and bump into this little stocky dude. I said, “Oh, sorry man. ” and he replied with “No problem.” And instantly it hit me. It was Udo! He must be about 5’1″ or so. I shook his hand and asked him to sign my ticket (see below). Both bands put on great shows, no matter if I liked the music or not. The musicianship was top notch for sure. 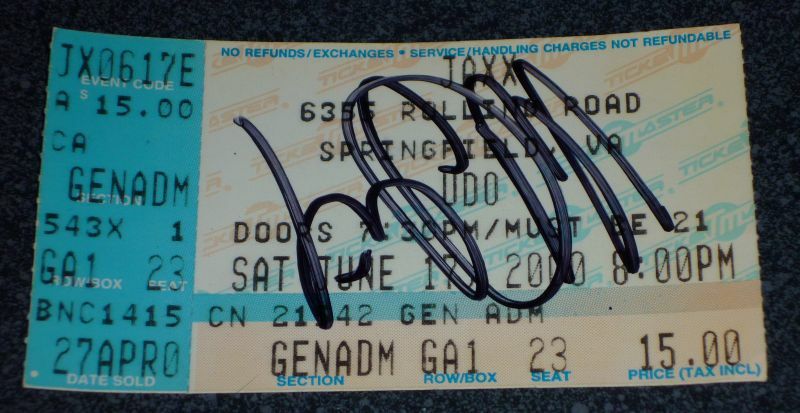 Ticket signed by Udo...flip it over and you can almost make out his name.